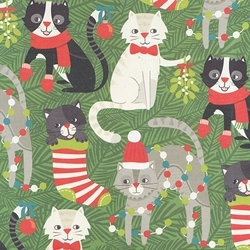 Adorable cats making mischief among festive stockings, mistletoe, and lights. Beautiful gift wrap! Also great for scrapbooking, bookmaking, collage, and more. 100% recycled paper, printed in the USA.